One of the last Jewish writers coming from Perpignan, France. He flourished in the first half of the fifteenth century. A rising against the Jews was the cause of his leaving his native city. Neubauer ("Ecrivains Juifs," p. 759; see also "Revue Etudes Juives," v. 41) places this riot in the year 1414, when the friar Vincent Ferrer roused the angry passions of the mob against the Jews for refusing baptism (see Grätz, "Gesch. der Juden," viii. 123); but Gross ("Gallia Judaica," p. 473) is rather inclined to place the date in 1420, when the Jews of Perpignan were exposed to all manner of vexatious proceedings by the Inquisition ("Revue Etudes Juives," xvi. 14). "It often happens that physicians find themselves in places where they can not procure required drugs except with great difficulty, and hence are placed in great embarrassment. This is particularly the case with those of our coreligionists who are obliged to dwell in villages or in the mountains to gain their living. There are places where one can not find a variety of drugs wherewith to make the necessary medicaments. 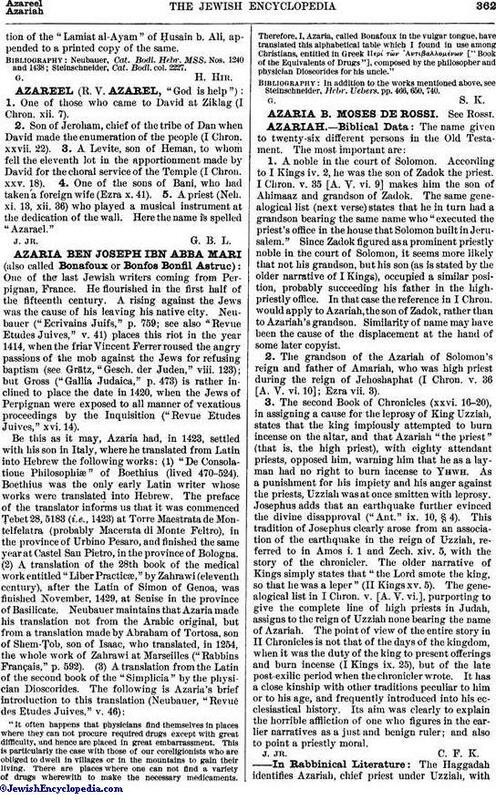 Therefore, I, Azaria, called Bonafoux in the vulgar tongue, have translated this alphabetical table which I found in use among Christians, entitled in Greek Περί των Αντιβαλλομἐνων ["Book of the Equivalents of Drugs"], composed by the philosopher and physician Dioscorides for his uncle." In addition to the works mentioned above, see Steinschneider, Hebr. Uebers. pp. 466, 650, 740.